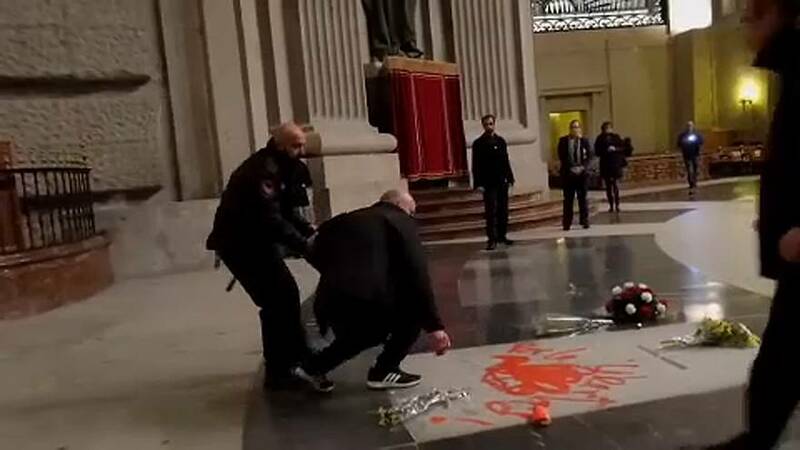 An artist has been arrested after painting a dove in red on General Francisco Franco's tomb, an attack that comes as debate rages in Spain over the exhumation of the country's 20th-century dictator. Artist Enrique Tenreiro can be seen in a video shared online as he kneels before Franco's tomb in the Valley of the Fallen, draws a dove and writes "for freedom" before security personnel take hold of him. Police later arrested Tenreiro, according to a statement by Spain's National Heritage department, which manages the glorifying mausoleum where Franco was interred in 1975. In a statement signed by the artist and emailed by aides, Tenreiro says he wanted to make a statement on behalf of Franco's victims.